While the delegates of the International Whaling Commission fought over the fate of whales ocean advocates stood tall in Panama as their voice. Today science has proven that cetaceans are sentient self-aware beings with intelligence equal to mans. Sadly, many members of the IWC use whaling as a bargaining chip to further their own agenda. The United States bundled their vote with Japan and the Soviet Union to protect the Bow head whale hunt, even going so far as to support the whaling in Greenland where whale meat is sold commercially to tourists while whaling under the guise of subsistence. IWC aboriginal whaling quotas were renewed for the U.S., Russia and the notorious St. Vincent and Grenadines known for their slaughter of humpback whale mothers and their babies. Greenland on the other hand was exposed for its blatant commercial use of whale meat losing any quota for whaling. Korea shocked the world as they made a bid to create a “scientific whaling program” which for Japan has been no more than a cover up for commercial whaling activities. Disappointingly the Southern Atlantic Whale Sanctuary proposed by Argentina, Brazil, South Africa, and Uruguay lost the vote not reaching the 3/4 majority. 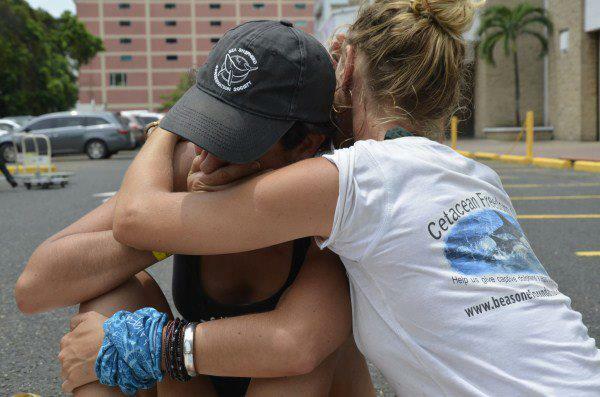 Maria Cristina Cely and Lori Neumann Whale Sanctuary fails to pass. Ocean activist Maria Christina Cely spoke moving words upon finding out the whales of the Southern Atlantic Whale Sanctuary would not be safe from the deadly harpoons of the whalers, “Tough times for those who were present outside the Panama Hotel in the very moment which made known the result of vote for the creation of the Whale Sanctuary South Atlantic. Disappointment, anger and helplessness …. everything in tears”. For a brief moment my spirit faltered once again I was ashamed of the species to which I belong (Maria Christina Cely July 2, 2012). Maria Cristina Cely taking a moment. 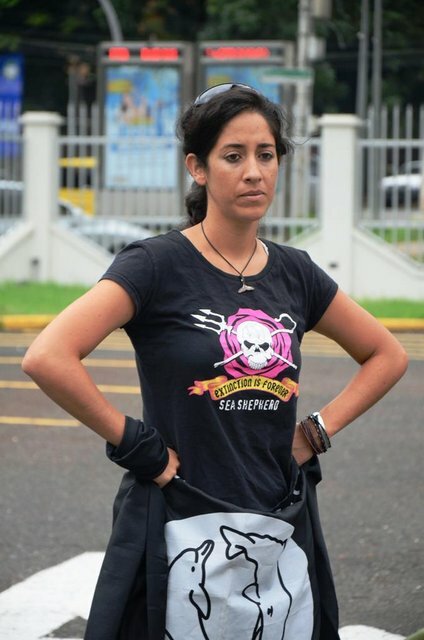 In an interview Maria Christina Cely ocean activist and Sea Shepherd volunteer/supporter gave us some insight in what it was like to be at the IWC a voice for whales. Champions: What inspired you to go to the IWC Meeting in Panama? Maria Cristina Cely: Well, the beginning of the whale’s ordeal takes place at the IWC and I think that is the place to start showing your support to them and condemning the whaler’s decisions. I also believe that they (whalers) need to know the world is watching and that we won’t let them walk away without giving them a piece of our mind. 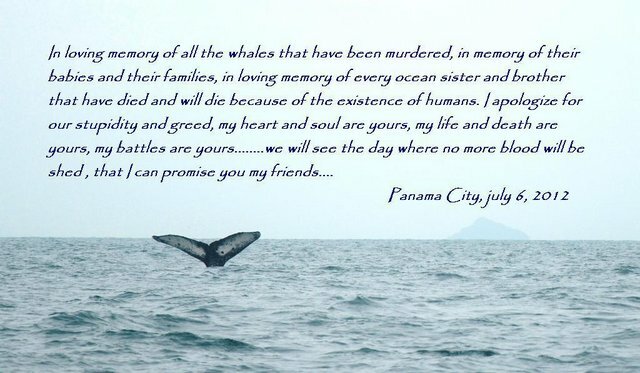 But the most important reason was the South Atlantic Whale Sanctuary, the Latin-american countries known as “Grupo de Buenos Aires” were going to fight again for the whales, they stood up and spoke up for the whales and did not sell their votes so I wanted to show them support and respect and let them know that WE were/are proud of them. 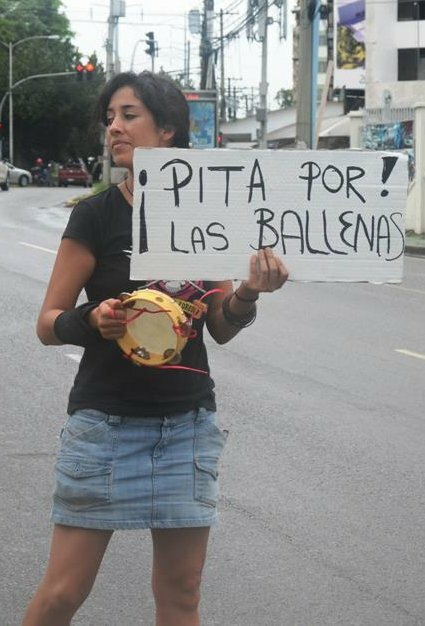 Maria Cristina Cely THE VOICE OF THE VOICELESS! Champions: What was the atmosphere like at the meeting? Maria Cristina Cely: Intense, very intense. You had us out there cheering and calling for the Sanctuary, then you had the delegates from the “Japan group” and the delegates from the pro-whales group and on top of that you had the NGOs. You can cut the tension in the air with a knife, that is for sure. The atmosphere changed after the first day when the Sanctuary proposal lost by a vote, then you could feel the disappointment and the anger but also frustration from the pro-whales parties. The things fired up a little when we rallied Panamanian students and gathered outside the Panama Hotel, the “Honk for the Whales” was a success and we even had some delegates and NGOs come out and cheer with us. 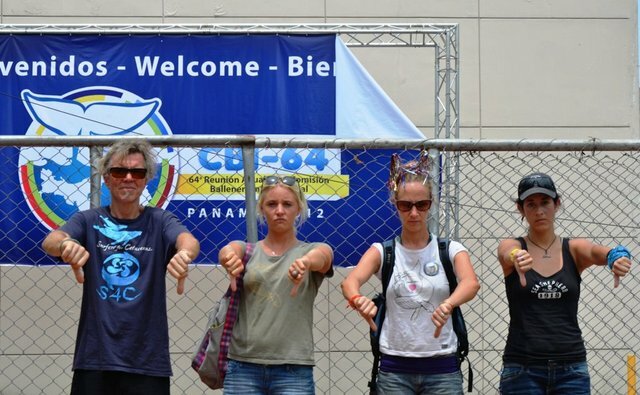 Ocean Activists at IWC Meeting Panama Raise your hands for whales! Champions: What was it like to be present at this meeting? Maria Cristina Cely: The IWC brings out every emotion in you. It is a roller coaster, you go from having all this energy and positive thoughts to frustration and disappointment. You want to break into the meeting and tell them how wrong they are and how stupid their killing proposals are, and you look at the delegates and feel rage because you realize this few people decide on the lives of thousands of whales, they profit from them and from their dead and that hits you so hard! It was quite an experience that I will do it again as many times as possible. You have to fight for the whales, the dolphins and the porpoises whether it is in Taiji, in the Antarctic waters, in the Faroes or at the IWC, every fight counts for the final battle, everything counts. 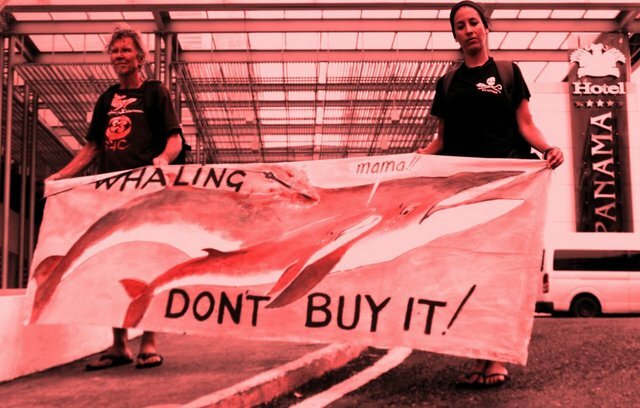 Howie Cooke, Natalie Fox, Nori Neumann, and Maria Cristina Cely Just say no to whaling! Champions: What did you come away with? Maria Cristina Cely: We as society need to be more present at the IWC even if it means not being present at the meetings. We need to push more pro-whale countries to take part, because every vote counts. But also we need to push the pro-whale countries to become more involved in working to recuperate the votes of the countries that today voted for Japan. So I hope I will see you guys there the next time. Together we can make a difference so get involved! This entry was posted in Cetaceans, Whales and tagged Cetacean, Humpback Whale, Indian Ocean Whale Sanctuary, International Whaling commission, minke whale, Sea Shepherd, whales, whaling by Kirsten Massebeau. Bookmark the permalink.